or company-wide business broadcasts are performing technically, as well as how their audiences are reacting to the information that’s being presented. With an improved audience experience, that includes sentiment tracking, and a highly intuitive administrative dashboard, the Event Success Dashboard displays: how live streams are being delivered to users across internal networks; timeline-based dynamic sentiment scoring they can use to gauge messaging effectiveness and give to presenters during events; quality of service roll-up scores for quick event technical grading, and much more. 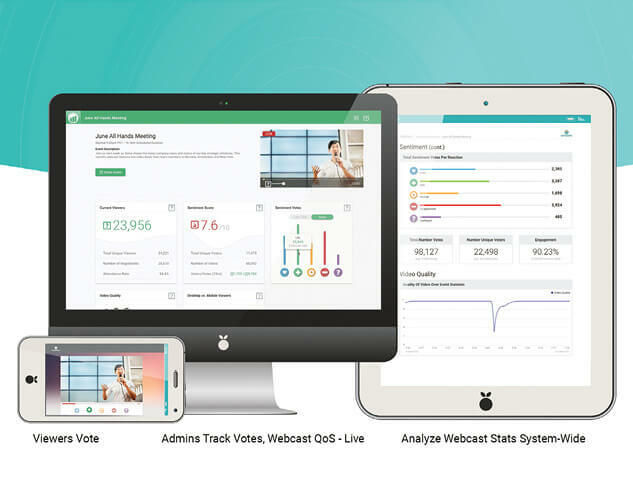 The Event Success Dashboard works with MediaPlatform’s award-winning Webcaster live webcasting platform, which leading companies use for “business broadcasts” that bring a TV-quality live webcast experience to desktops and devices to connect, motivate and engage workers. At the forefront of digital workplace transformation, these organizations understand video’s ability to attract, stimulate and retain top talent – including digital natives and Millennials who are already prolific video consumers and producers. MediaPlatform enterprise video customers are typically multinational corporations with multiple locations and a high percentage of knowledge workers – such as Financial Services, Professional Services, Technology, Healthcare and Pharmaceutical and Life Sciences. Event Admin Dashboard: Live webcast administrators and owners can assess, and report webcast quality and live viewer feedback using non-technical, intuitive widgets and displays. Real-Time Webcast Attendee Data: See audience size and drill down to find specific users. View attendee-to-registrant ratio. Quality of Audience Engagement: Track audience engagement by number of viewers, average length of stay, viewer drop-off points, number of “sentiment votes,” poll response rates, average number of questions asked. Sentiment Tracking: Monitor – live – how the presenter’s information is being positively or negatively received by audiences. Collect data across presentations for post-event analysis and comparison. Network QoS Roll Up: Easily assess webcast effectiveness, and liaise with IT and networking teams, in real time, using roll-up scores from complex network performance information gathered by MediaPlatform Video Business Intelligence analytics. Event Success Reporting: Generate high value reports that provide deep insights into event effectiveness. All live data is available immediately for objective, accurate assessment. No need for post-event anecdotal employee polling. This article is sponsored by MediaPlatform.